Anyone who has been following me on social media will have seen my allusions to some recent hauling. I have only received about 1/3 of what I've ordered so far (the rest will be coming with my mum in June), but I am nonetheless thrilled to have some new products to play with! As you can see here, I've been bitten by a major Marc Jacobs Beauty bug! Here are six (6!) of the Marc Jacobs Beauty products I recently picked up...and be forewarned that there will be a Marc Jacobs Beauty haul part deux as I'm also waiting on one of the eyeshadow palettes, another eyeliner, one of the new nudes lipsticks, and a contour/highlighter duo. 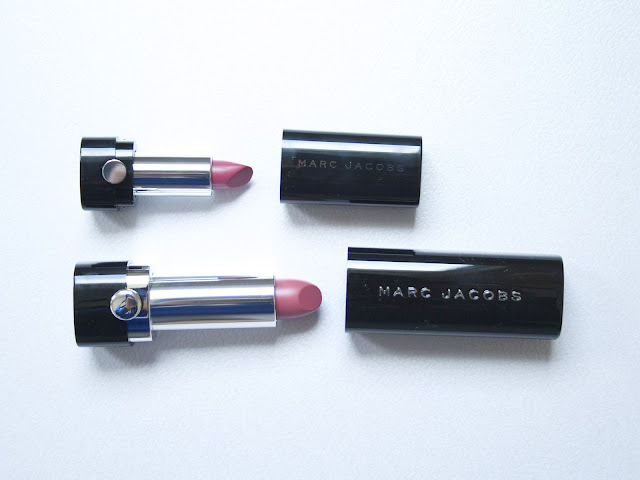 When Marc Jacobs Beauty first launched, I was not interested in the brand at all. Last summer I gave it another try by picking up one of the Twinkle Pop Eye Sticks in the shade Leila (which I reviewed here). I ended up returning Leila, though, and it wasn't until I tried out a deluxe sample of the Highliner Gel Eye Crayon in 54 Brown(Out) that I found an MJ product that I liked! 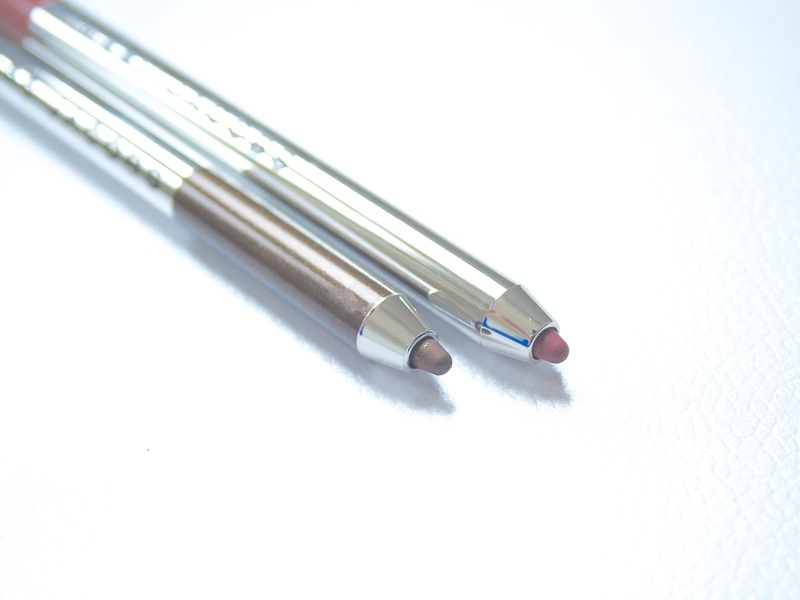 Like quickly turned to love with the Highliner formula—and Brown(Out) became my go-to eyeliner (dark enough to emphasize my lash line, but not as harsh as black, with a smooth application and outstanding wear time). So, naturally I had to order a full size replacement of the Highliner Gel Eye Crayon in 54 Brown(Out) as soon as I used up my deluxe sample. 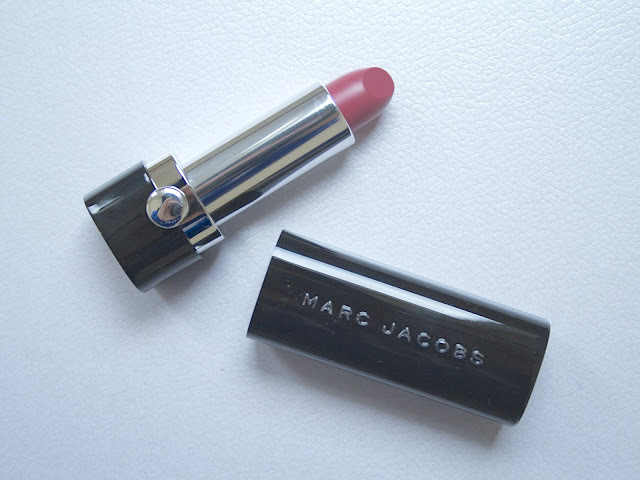 I also took advantage of a MarcJacobsBeauty.com code to grab a sample of the Le Marc Lip Crème in 216 Kiss Kiss Bang Bang, a baked rose shade. I've heard lots of people rave about this shade and already know I love the Le Marc Lip Crème formula (see my review of Je T'Aime here). I also bought a full size of the Le Marc Lip Crème in 228 Infamous, a soft peony. I already love Infamous. It is a beautiful and wearable neutral pink, and worn over the P(Outliner) Long Wear Lip Pencil in 304 Prim(Rose) it gives the most beautiful semi-matte '90s lip. The name Prim(Rose) made me think that the shade would be pinker than it is. The colour description, "cocoa spice", is pretty accurate, though—it's a mid-tone pinky brown shade that is very complimentary on my lips! And the formula applies without any dragging or skipping. Lush. I rounded out my lip selections with one of the new Enamored Hi-Shine Lip Lacquers in 302 Allow Me, a rosy shimmer. 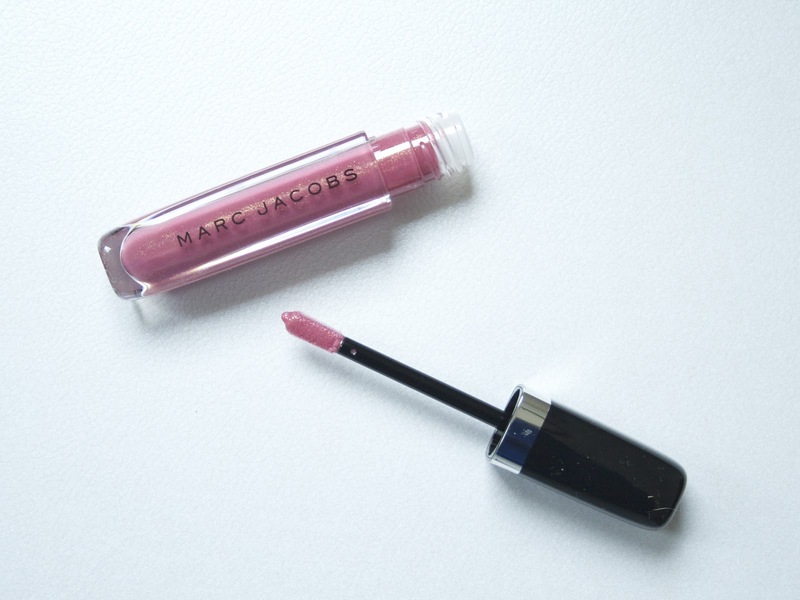 The Enamored Hi-Shine Lip Lacquers seem to have replaced the Lust for Lacquer formula in the Marc Jacobs Line. I haven't tried this out on the lips yet, but the colour is gorgeous and Temptalia has noted that the formula isn't particularly sticky. And last, but most certainly not least, is the Shape Contour and Blush Brush No. 15. I cannot express my love for this brush more clearly than this: if you contour, you NEED this brush. It is ludicrously good. 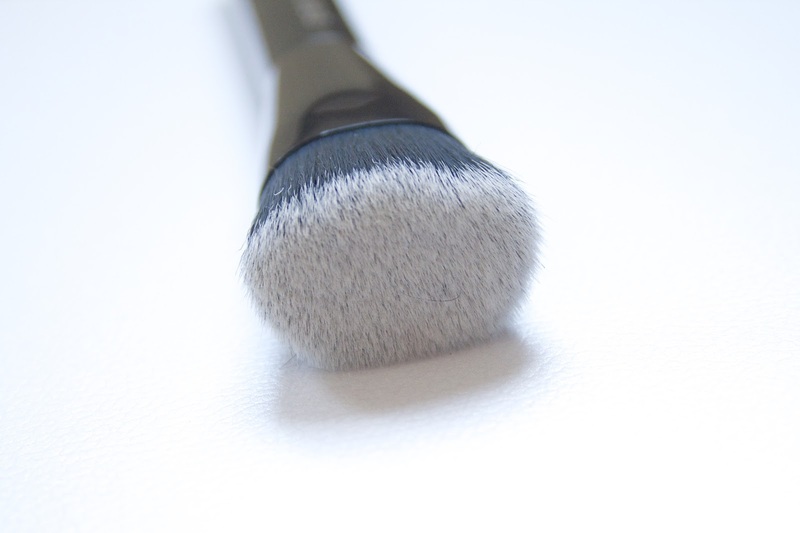 It is very soft but also very dense, and it's shape makes for foolproof contouring. I've never had my contour blend so easily as with this brush. Right now I'm using it with my Anastasia Beverly Hills Contour Palette (reviewed here) but I'm already excited at trying it with the MJ #instamarc Light Filtering Contour Powder in Mirage that is on its way to me. I'll keep you updated with how all of these products perform for me over the coming weeks (and I will certainly follow up when the remainder of my Marc Jacobs items arrive). 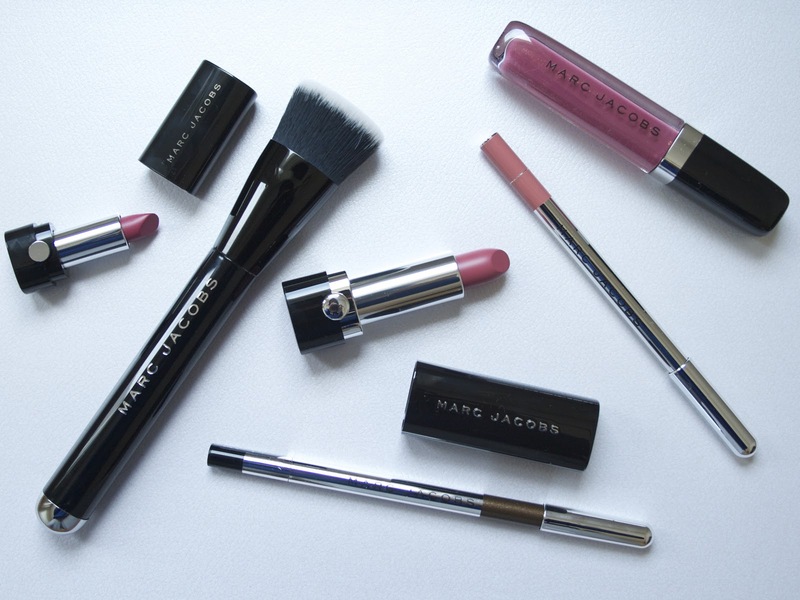 In the meantime, let me know if you have any Marc Jacobs favourites! Is there anything I need to try out? Let me know below! And please head to Bloglovin, Instagram, and Twitter to follow me!